Robert Wilkinson Padley was born in Nottinghamshire in 17751: his brother was the well-known “Squire” Padley of Bulwell, a keen sportsman in his native county. Nothing is known of the training of Padley as an artist, though his style is very close to both James Barenger and to Philip Reinagle RA, both artists to whom his works have on occasion been attributed. He seems to have been a gentleman amateur painter, though he did exhibit two paintings at the British Institution in 1815. The only known paintings by him are all of birds, and all are unsigned on the front of the painting. Several, though, are recorded with a signature and/or a description of the subject matter on the original stretchers. These latter are un-keyed stretchers typical of the late 18th and early 19th centuries. Doubtless many have been replaced by more modern keyed stretchers in the intervening 200 years, and the information thereby lost. 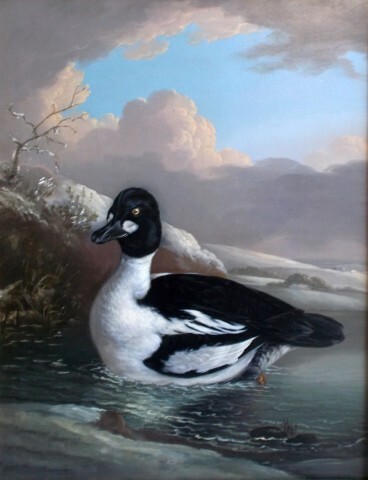 Two other pictures of a Goosander and a Gull are in the Mellon Collection at Yale; they are likewise identified on the original stretcher. Padley was buried in the church at Bulwell in 1835; in the same church is a memorial to his young wife Catherine, of Bulcote Lodge, who had died 9 Nov. 1829, aged 26.